Hopefully you have found many Easter nests and Easter eggs and are enjoying the fantastic weather. Even knocked out with the flu, it looks glorious. After you have eaten all the chocolate, fondant, cream & other eggs, here is an eggscelent dish to cope with the surplus of hard-boiled variety after Easter or to have a nice vegetarian dish up your sleeve to detox after all the eggstravaganza of four feasting holidays. Enough, this herby sauce is an eggstraordinary great condiment for cold cuts of meat or smoked fish (trout, mackerel), too. Every Hessian market stall in spring is packed with wonderful billowing parcels of herbs for Grie Soß, green sauce. As soon as you point to one, a white paper scroll brimming with green garden herbs is carefully unrolled before your eyes and today’s mixture explained. For this green sauce is a local speciality, it is a seasonal dish since the herbs have to be grown here (nearly an appellation contrôllée & no far flung air-travellers allowed) and therefore composition of greenery changes as the season progresses. The market woman recants the different herbs and either for theatrical purposes or in case you are not so familiar with some of the rarely seen herbs points to them and explains some more, gives recipe tips and so on. You see, this green sauce and the herb mixture is a matter of pride and at least 7 of the following herbs have to be present: curly parsley, chives, chervil, cress, salad-burnet, borage, sorrel, dill, tarragon, lemon balm. Traditionally, eggs with Frankfurter Grüne Sauce are eaten predominantly on Maundy Thursday (Gründonnerstag). 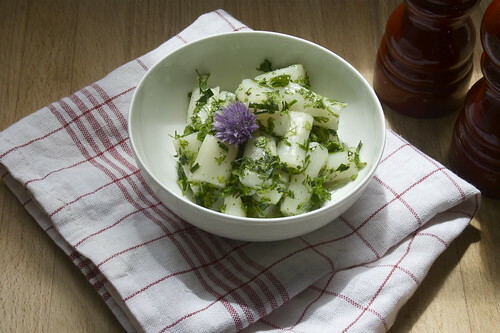 According to local folklore it was Goethe’s favourite dish and why not: a simple dish of new potatoes, eggs and the intensely green, fresh & herby sauce is a spring delight. Some recipes are rather more strict on the ingredients & herb selection, others include finely chopped hard-boiled eggs in the sauce but that’s too many eggstra eggs for me. 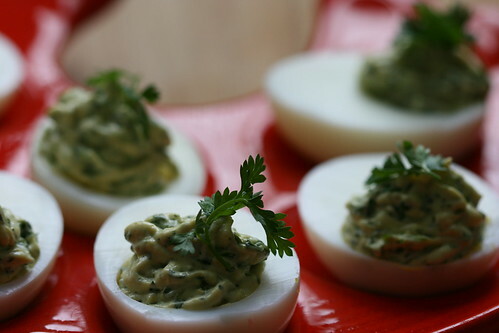 And before some are up in arms: the picture shows a green sauce with more quark in it – eggscident. Though is a classic dish throughout the whole season and can be found in various forms on every Straußwirtschaft menu, casual little taverns or pubs at a vineyard, preferably outside, where homemade cold cuts, small plates & little morsels, salads & hearty fare is sold, just perfect for a stop on your Sunday stroll and naturally, it provides a good base for some extensive – where you expecting a different word? – Riesling tasting. My favourite is ham in aspic, topped with a dollop of a runnier green sauce and fresh rye bread. Oh, why don’t we go now? Chop your herbs very fine and tip them into a large bowl. Add sour cream until you have a green puree and thin the sauce with a little vinegar (start with a tablespoon) and some oil (2-3 tablespoons). Most times this sauce is rather thin though I like to add a few spoons of quark for a stiffer version to serve with eggs & potatoes (some people prefer the unctuousness of mayonnaise). Traditionalists even add finely minced hard-boiled eggs to it – too much if you eat it with eggs, I think. Serve with just about hard-boiled eggs & new potatoes. Riesling, anyone? Bon appetit. Die Kräuter sehr fein wiegen und in eine große Schüssel geben. Saure Sahne unterrühren und das grüne Püree mit etwas Essig (zunächst 1 EL, eventuell mehr) und mehr Öl (2-3 EL, eventuell mehr) mischen. Je nach Geschmack und gewünschter Konsistenz mehr oder weniger Essig & Öl hinzugeben, für eine dickere Sauce zu Kartoffeln gebe ich noch etwas Quark oder einen Löffel Mayonnaise hinzu. Mit Salz & Pfeffer abschmecken und zu den harten Eiern und warmen Kartoffeln servieren. Vielleicht ein Glas Rieslíng dazu? My red hen egg-platter (rescued a few weeks ago from a charity shop, don’t you think that was a great find?) cries out for devilled eggs, although here in Germany filled eggs are known as Russian eggs but contrary to their American equivalents (‘deviled eggs’) which are cherished everywhere, they still snooze in their glass coffin, ahem, reputation of old-fashioned twee-ness or dusty cocktail party fare. 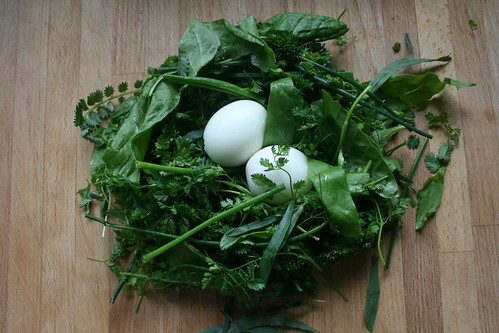 Time for a resurrection: I love chervil-filled (or chervilled eggs), the grassy & aniseed taste catapulting us into spring and I have included two pure chervil halves on my platter (why choose, if you can have both?). They are mingling on the plate – it is party food after all – with Béarnaise eggs, whose bellies are stuffed with a chervil, tarragon & lemon cream and allude to the famous sauce Béarnaise. I am absolutely potty about this classic since I encountered it as a child, dining with my father on white asparagus and steak. To me, nothing beats that taste & memories included and I make, regrettably not so frequently as I would like, both versions: the proper and the super quick one which I shall post soon-ish when I allow myself to eat another ton of butter. So, even if you are not a premium member of the Béarnaise-Sauce-Appreciation-Society, the elegant, grassy & fresh anise flavours grace any egg and these chervilled ones will be a great sight on that Easter brunch table. I don’t know about you, but I am keeping my fingers crossed for an outdoors picnic! 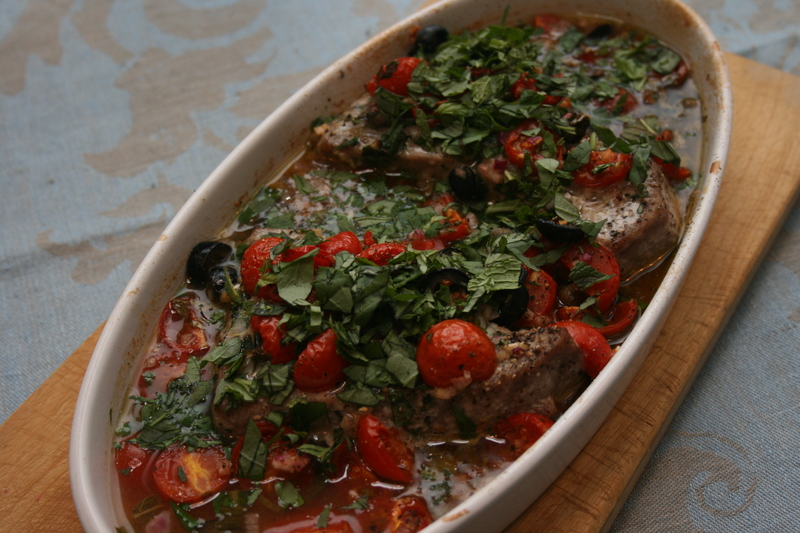 If you do not happen to have a red hen dish in your cupboard, they nestle spectacularly in a bed of herbs. Update: Try the Chervil & tarragon filling as a dip for crudités: crisp radishes, carrots, sugar snap peas, celery, cucumber, broccoli & cauliflower florets etc. Hmhmm. It is hard to give precise measurements here, since personal preference and taste plays a big part in this recipe. I prefer handful measures, it is very personal and people seem to automatically take the right amount without thinking too much about it. I like a lot of herbs and try to aim at a minimum amount of mayo & quark added here, to get a rather stiff filler and prefer a 50-50 mixture of mayo & quark, added spoon by spoon to see when it is enough and not too much. Add more or less herbs, go full mayonnaise or mix as I do with a stiff quark or alternatively Cream cheese or firm Greek yoghurt – nothing to thin or liquid. 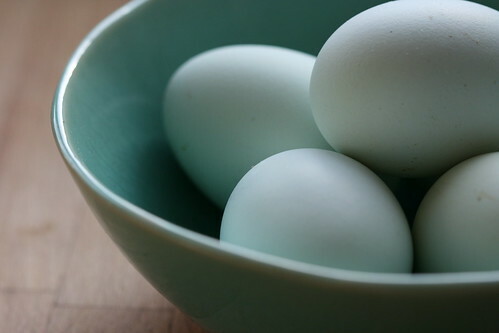 (Don’t boil) your eggs: place them in a small pot or saucepan, cover with cold water and bring to a soft simmer. As soon as you see bubbles appear, take them of the heat, cover with a lid and do not touch for 11 minutes (10 minutes has the yolk slightly soft in the centre). Interrupt the cooking (otherwise there will be that greenish ring around the yolk) by dousing them with cold water. Peel and, when cool, halve them. Carefully remove the egg yolks and strain them through a mesh sieve. 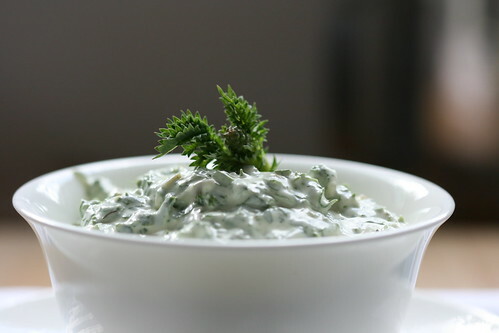 Mix them with your chopped herbs, add mayonnaise and quark only in small doses to achieve a stiff cream with the minimum amount added to it, that is not too soft and you can pipe (and will hold its shape for the party). Season the filling with salt & white pepper and just a hint of lemon juice or even tarragon vinegar. Pipe it into the white halves (best if they are already on their serving plate) by using either a small piping bag, a freezer bag with a corner cut of or just take a teaspoon. Decorate with small chervil leaves, tiny amounts of bright trout caviar or what comes to mind. Es ist schwer, hier genau Mengenangaben zu geben, da persönliche Vorlieben und Geschmack eine große Rolle spielen. Daher bevorzuge ich die Handvoll als Maßeinheit, da man beinahe automatisch eine dem eigenen Geschmack entsprechende Menge greift ohne viel darüber nachzudenken. Ich bevorzuge viele Kräuter im Verhältnis zu Eigelb und wenig Mayonnaise & Quark, die ich nach und nach und ungefähr in einer Mischung von 50/50 hinzufüge. Lieber weniger als mehr, da sonst die Füllung zu flüssig wird und keine Party durchhält. Man kann natürlich auch mehr Mayo nehmen oder den Quark durch Frischkäse oder dicken griechischen Joghurt ersetzen. Die Eier (nicht) kochen: man lege die Eier in einen kleinen Topf oder Kasserolle, bedeckt sie mit kaltem Wasser und bringt das Ganze zu einem leichten Simmern. Sobald das Wasser simmert und Bläschen aufsteigen, nimmt man die Eier vom Feuer, legt den Deckel auf und lässt den Topf unberührt für 11 Minuten stehen (nach 10 Minuten sind die Eier perfekt zum Essen, das Eigelb hat aber noch eine weiche Stelle, deshalb lieber 1 Reserveminute für große Eier). Dann schreckt man die Eier mit kaltem Wasser ab und pellt sie, wenn sie kalt genug sind. In zwei Hälften teilen und die hartgekochten Eigelbe durch ein Sieb streichen und mit den fein gewiegten Kräutern sowie wenig Mayonnaise & Quark mischen und mit Zitronensaft, Salz & weißem Pfeffer würzen. Die Creme sollte nicht zu dünn werden, damit sie entweder mit einem kleinen Spritzbeutel oder einem Gefrierbeutel (füllen, dann eine Ecke abschneiden) in die leeren Eiweiß spritzen. Am besten macht man dies, wenn sich die Eierhälften schon auf der vorgesehenen Servierplatte befinden. Mit einem Kerbelblättchen oder ein wenig Forellenkaviar dekorieren und sich am Anblick und Geschmack erfreuen.